Coming off its centennial season, Theatre NDSU is diving into its next 100 years with “Little Shop of Horrors,” the dark comedy musical running around Halloween at the school’s Askanase Auditorium. 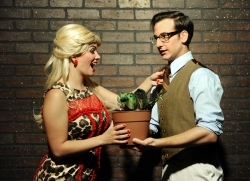 Set in the 1960s on Skid Row in New York, “Little Shop” follows Seymour and Audrey, two coworkers caught in a love story with a menacing, man-eating plant in the middle. Bringing booming business to the down-and-out florist with the world’s most unusual plant, Seymour soon discovers that the plant (Audrey II) can only be vitalized with human blood. Its appetite soon leads Seymour from offering his fingertips to finding bigger prey. Designing this sinister plant was an interesting challenge from the start. Numerous “Little Shop” plants are available online, but Koenig and his crew wanted something darker than what was available as well as something that would work with set design, as Audrey II grows throughout the show. So Theatre NDSU opted to design its own Audrey II, creating four different sized plants, from a tiny baby to a monster requiring two people to bring to life. As Koenig explained, all of these plants had to fit with the set designed by Tiffany Fier, who also had a hand in Audrey II’s design. Coordinating the plant’s voice-over with its mouth movement is another challenge that came with the plant, and a recent shop rehearsal spent some serious time practicing this. Koenig knows how unfulfilling it would be if the plant’s voice and mouth do not match up, but he is positive it will all come together. 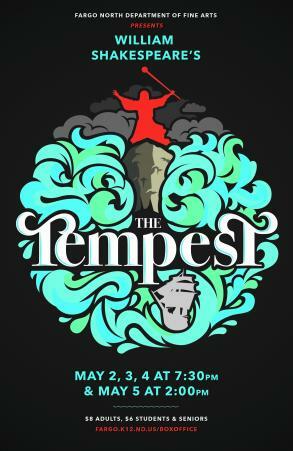 Over 20 students at NDSU help bring this show to the stage the next two weekends, working in every area from actors to musicians to costume crew to stage managers. It’s a true student effort that Koenig is proud of, as the main aspects where faculty come in are lights and set design. Everything is mostly students. In conjunction with this student-effort show, Theatre NDSU has coordinated a blood drive with United Blood Services, something Koenig especially highlights.